Château Brown Blanc is lively and refreshing, so it matches perfectly with white fish and recipes with cooked seafood (salmon and scallop tartare, lobster …) or raw fish (sushi, sashimi …). Thanks to barrel ageing, our white wine is fleshly and can be associated with white meats (chicken, veal …) in sauce or grilled. 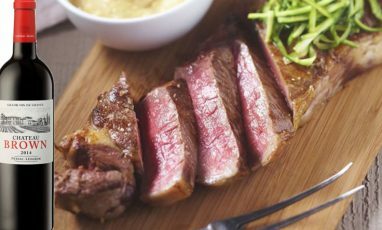 It also goes well with a variety of lighter dishes such as salads, or as an aperitif with cheeses (emmental, conté, old parmesan) or toasts (salmon terrine or duck mousse). 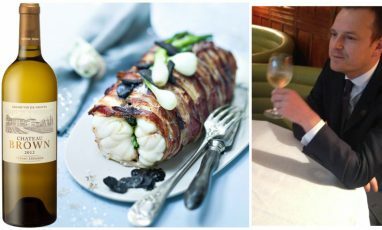 The sun and spring are back, it’s the perfect time to enjoy a glass of Château Brown Blanc… Have it with some pollock with parma ham. 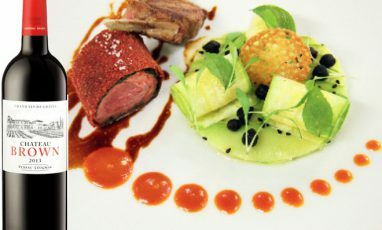 With our 2012 white vintage, wine & food pairing is suggested by Adam Wilson, Restaurant Manager and Sommelier at Hix Mayfair at Brown’s Hotel 5* in London in september 2013. With our 2013 white vintage, wine & food pairing is suggested by Daniel Pires, Sommelier, Restaurant Laurent in Paris in february 2015. With our 2014 white vintage, wine & food pairing is suggested by Benoit Castillon, Head Sommelier at Hôtel du Palais in Biarritz in february 2016. 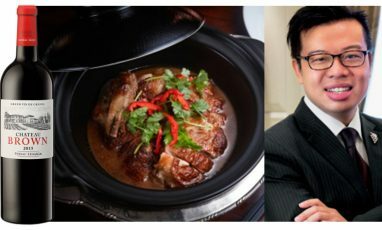 With our 2015 red vintage, wine & food pairing is suggested by Kay Man, Head Sommelier at Peninsula hotel in Hong-Kong in november 2016. 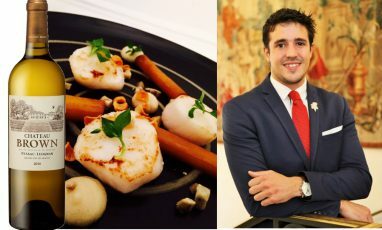 With our 2016 white vintage, wine & food pairing is suggested by Adrien Cascio, Head Sommelier, and Romain Guyot, Head Chef at Restaurant Le Gabriel in Bordeaux. 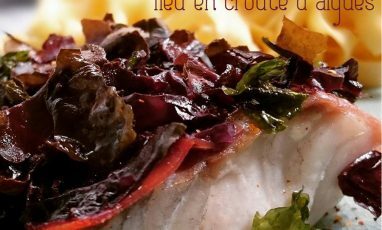 In automn scallops are back ! 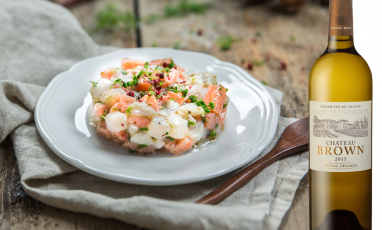 Discover a delicious recipe to enjoy with a glass of Château Brown White 2015: scallop and salmon tartar. Château Brown Rouge is well balanced with silky tannins and black fruits aromas: a typical wine of Pessac-Léognan appellation composed of 3 grapes varieties: Cabernet Sauvignon, Merlot and Petit Verdot! 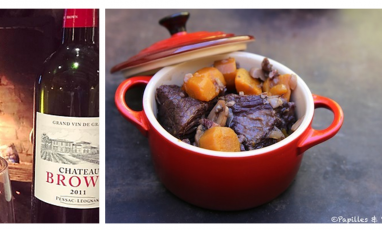 Château Rouge Brown is perfect with grilled, roasted or stewed meats. 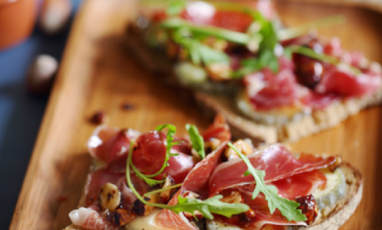 A successful wine & food pairing with our red could be also with some cheeses such as Saint-Nectaire or with a multitude of Asian dishes and fish-based recipes like tuna. Our red vintage 2011 is good to drink now, you will appreciate its fruity expression and the finesse of its tannins with beef bourguignon. 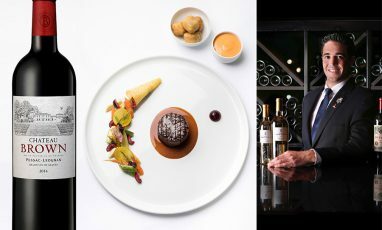 With our 2013 red vintage, wine & food pairing is suggested by Daniel Pires, Sommelier, Restaurant Laurent in Paris in july 2015. With our 2014 red vintage, wine & food pairing is suggested by Benoit Castillon, Head Sommelier at Hôtel du Palais in Biarritz (july 2016). 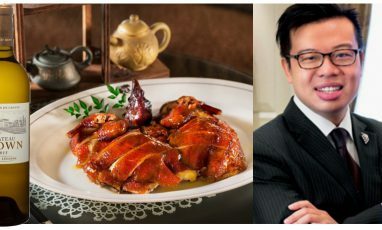 With our 2015 red vintage, wine & food pairing is suggested by Kay Man, Head Sommelier at Peninsula hotel in Hong-Kong in June 2017. 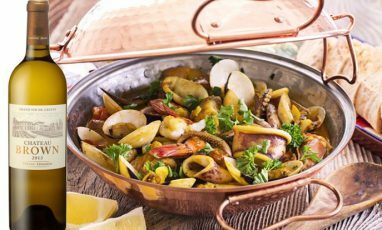 Try this hot dish during a cooler summer night. 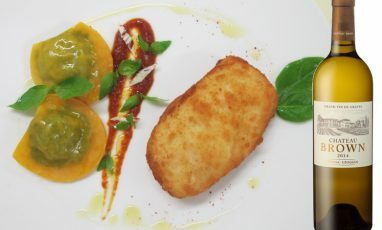 Chorizo and Burrata will be a successful pairing with this vintage of red and its crispy fruit and silky tannins. Chateau Brown Rosé has an intense aromatic palette dominated by strawberry. The round and refreshing mouthfeel with a charming oaky cinnamon and vanilla finish invites us to drink it with a variety of cooked fish! 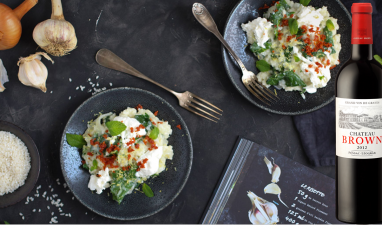 It is also ideal as an aperitif with finger food or very simple dishes such as green pesto pasta, grilled vegetables or salads. 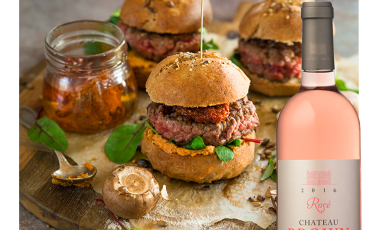 Chateau Brown Rosé is great with a meal, or further into the hot summer night ! Rosé wine doesn’t need a season ! 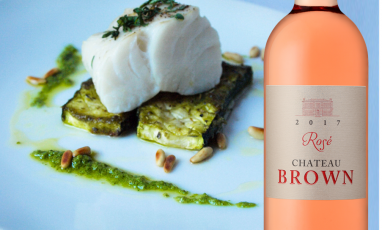 Discover our rosé all year round with a food and wine pairing based on fish, and pesto sauce.